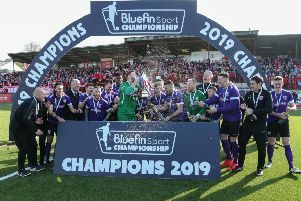 Larne were not at their best but they did enough to run out comfortable 3-0 winners at home to Sport & Leisure Swifts in the County Antrim Shield. A brace from Guillaume Keke and one from James McCabe sealed the victory. Manager Davy McAlinden summed up the performance after the game. “It wasn’t pretty as again we played in fits and starts. We were up against a team who made it difficult for us but we have scored three goals and we are in the next round. The boys coming off the bench did well and James McCabe got on the score sheet which he needed. After a scrappy start Larne upped the pace and took the lead 10 minutes before the break. A long clearance broke to Keke who played in Paul Maguire. His shot was blocked but the ball broke back to Keke who drilled a low shot into the net. Maguire went close to doubling the lead four minutes later with a fine turn and shot which was straight at the keeper. Midway through the second half a pass from Stuart McMullan evaded the visitors defence but Keke was unable to supply the finishing touch. With 10 minutes left a John Donnelly free-kick was handled in the defensive wall. The referee pointed to the spot for Keke to hammer the ball into the corner of the net. Four minutes later Thomas Robinson sent in an inch-perfect cross for McCabe who headed over from close range. The striker made amends a minute from time with a clinical strike from 22 yards giving the keeper no chance. LARNE: Flood, McGrandless (McClean 88), Smith, Rodgers, McMullan, Irvine, G. Gillan, McGonnell (Donnelly 73), Maguire (McCabe 80), Keke, Robinson. Unused subs: Stuart, Stitt. SPORT & LEISURE: Magill, Lynch, O’Hare, S. Tully, Carland, Johnston, Daly, P. Tully, McAuley, Gallagher, McKissock. Subs: McGrourty, Clelland, Glenholmes, Flynn.